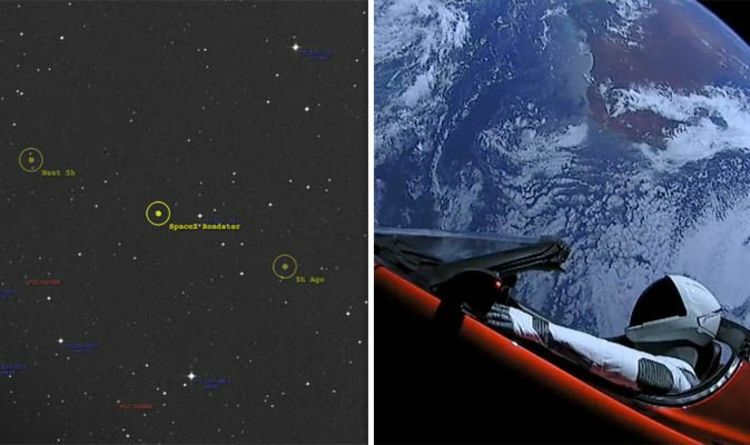 Home / غير مصنف / SpaceX: Where is the Tesla Roadster RIGHT NOW? Can you track the Roadster? SpaceX: Where is the Tesla Roadster RIGHT NOW? Can you track the Roadster? Elon Musk’s Tesla Roadster is an electric sports car serving as the dummy payload for the February 6, 2018 Falcon Heavy test flight and became an artificial satellite of the Sun. The car is currently the only production car in space and the driver’s seat is occupied by “Starman” - a mannequin dressed in a spacesuit. The car itself used to be Mr Musk’s and frequently drove him to work. Where is the Tesla Roadster right now? At the time of writing, the Tesla Roadster is 227 million miles (365 million km) from Earth, according to theskylive.com. The flying car is also 143 million miles from the Sun. The car has already exceeded its 36,000-mile warranty while driving around the Sun by more than 13,000 times. David Bowie songs are playing on repeat as the unusual spacecraft orbits between Mars and Jupiter. During its year in space, Starman has listened to David Bowie’s Space Oddity in one ear and Life on Mars in the other. This means, if the battery still works, Space Oddity has played more than 100,000 times since launch in one ear and Life On Mars has played 135,000 times in the other. Can you track the Roadster? Although being safe up in space at the moment, simulations over a three-million-year timespan found a probability of the Tesla Roadster colliding with Earth at approximately six percent. A slightly lower likelihood sees the car crash into Venus at approximately 2,5 percent. These probabilities of collision are similar to those of other near-Earth objects. Studies also showed the Tesla Roadster is due to make its closest approach to Earth in 2091 when it will come within a few hundred thousand miles of the planet. Orbital dynamics experts Hanno Rein, Daniel Tamayo and David Vokrouhlick found Earth, Venus and the Sun are the three most likely collision targets for Starman and the Tesla Roadster. A crash with Mercury and Mars are the least likely scenario as is Jupiter’s gravity catapulting the car out of the solar system.